William Morrow Paperbacks, 9780060929954, 416pp. 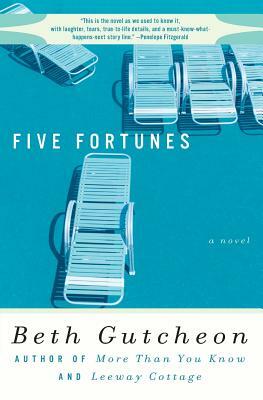 Witty, wise, and hope-filled, Five Fortunes is a large-hearted tale of five vivid and unforgettable women who know where they've been but have no idea where they're going. A lively octogenarian, a private investigator, a mother and daughter with an unresolved past, and a recently widowed politician's wife share little else except a thirst for new dreams, but after a week at the luxurious health spa known as "Fat Chance" their lives will be intertwined in ways they couldn't have imagined. At a place where doctors, lawyers, spoiled housewives, movie stars, and captains of industry are stripped of the social markers that keep them from really seeing one another, unexpected friendships emerge, reminding us of the close links between the rich and the poor, fortune and misfortune, and the magic of chance.